"In the heat of a late afternoon, the stifling air red with dust, the main road empty of life, he conveys a difficult and lonely existence, where man constantly battles against the elements." 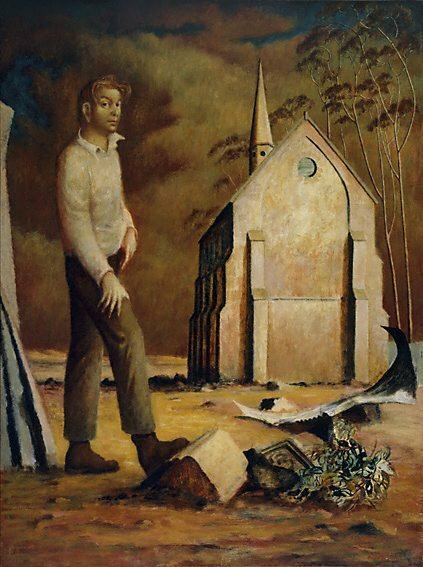 In mid-August 1947, prompted by a Sydney Morning Herald article on the deserted gold towns of New South Wales, fellow artist Donald Friend suggested to Drysdale that they make a trip to the Bathurst area to run in Drysdale's new car. On the way to Hill End where they spent the night, they stopped at Sofala, 200 kilometres west of Sydney. The resulting 'Sofala', also in the collection of the Art Gallery of New South Wales, is one of Drysdale's finest, most powerful paintings. With its compelling evocation of the atmosphere and ambience of a oppressively hot summer afternoon in the deserted main street of this historic country town, it transcends literal description of a particular place, to become an expression of the quintessential qualities of an inland Australian town. Drysdale's later portrait of Donald Friend standing outside the rear of Hill End's Presbyterian church, is a tribute to their friendship and association with these towns whose unique qualities were cherished by both artists.